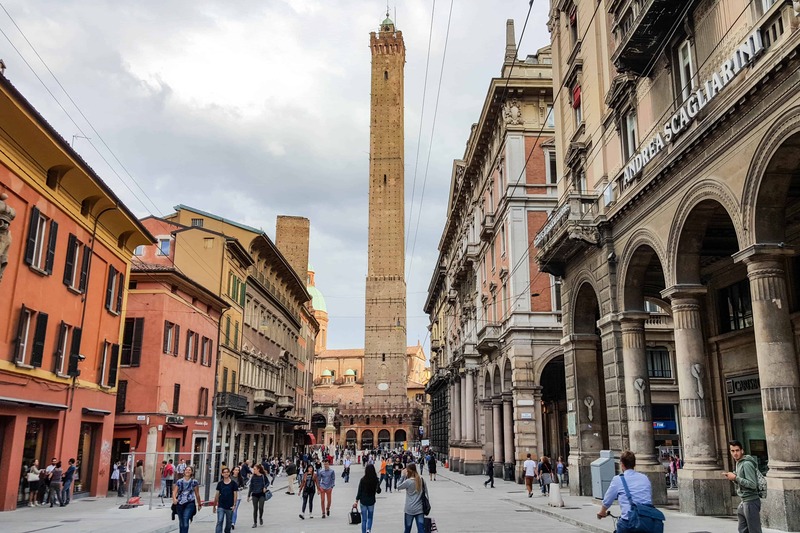 This Bologna travel guide details all the best places to eat, drink, and stay in Bologna, Italy – one of the best places to eat in Italy! 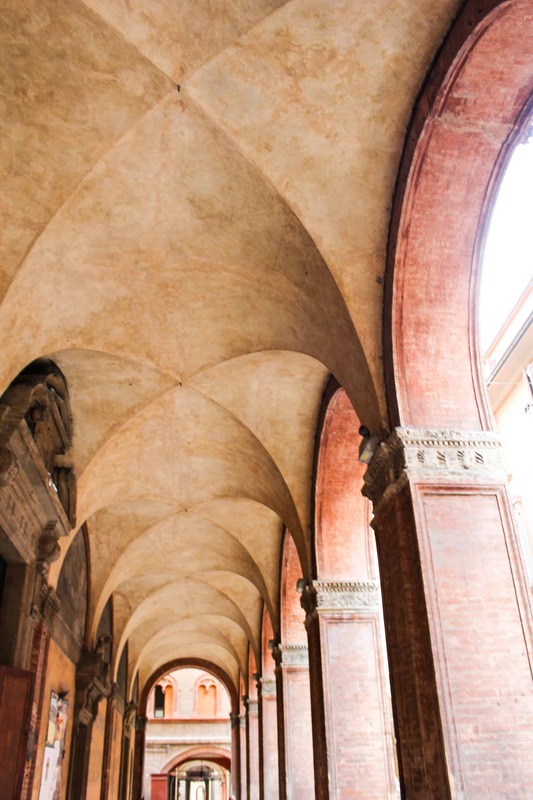 Of all the cities we planned to see in Italy, I was most excited to visit Bologna. 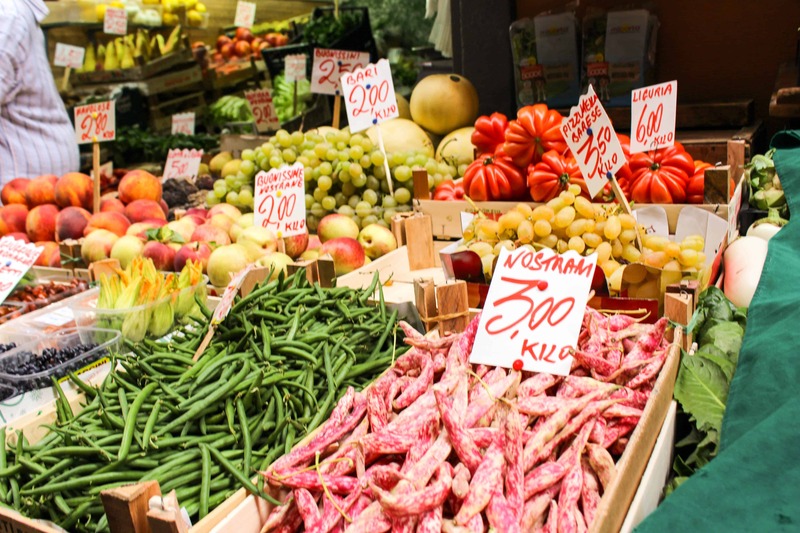 Even other Italians will agree, Bologna and the surrounding region of Emilia Romagna has the best and most celebrated food in all of Italy. After all, it’s where Parmigiano Reggiano, what Mario Battali calls the “undisputed king of all cheeses,” is made. It’s where balsamic vinegar is aged and refined. 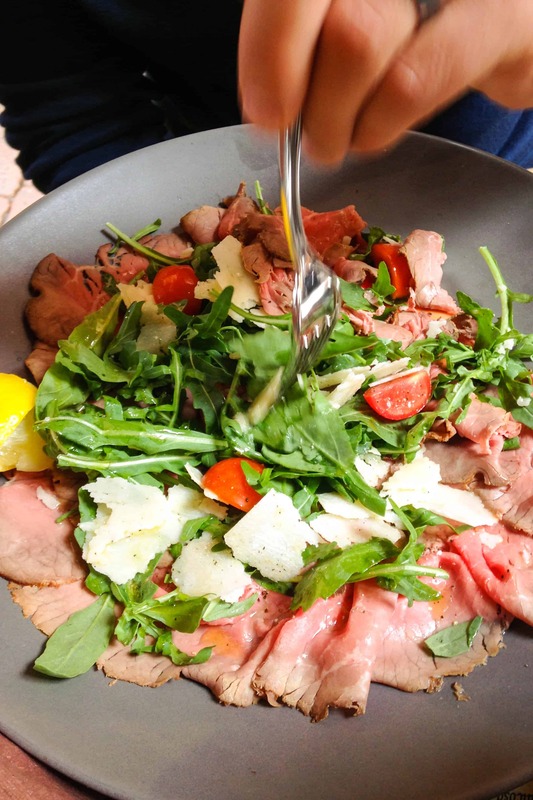 It’s where mortadella, culatello and prosciutto di Parma are crafted to perfection. And of course, Bologna is where everyone’s favorite pasta sauce, Bolognese, was originated. After returning our beloved Peugeot to the airport, we arrived at Hotel Al Capello Rosso right in the heart of Bologna’s historical district. We loved this hotel – it was centrally located, quirky and very well appointed. We dropped off our bags, then set out on foot to find lunch. 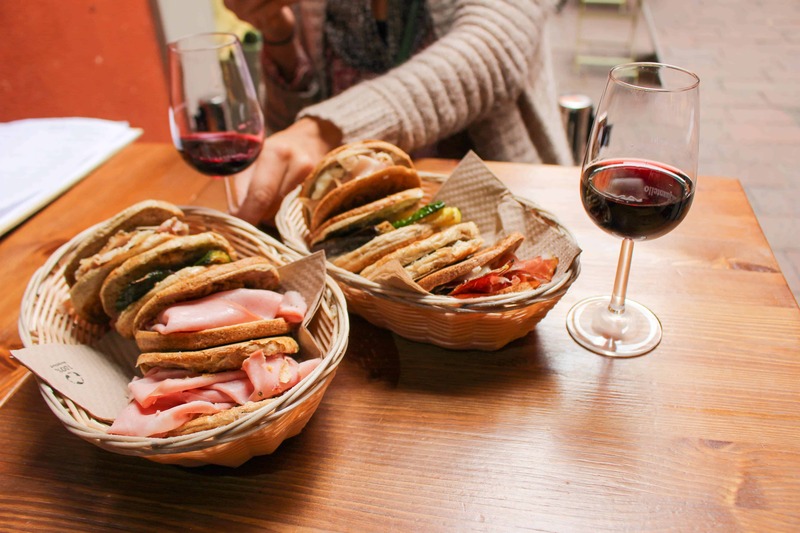 We sat down at a table on the street at Zerocinquantino for some traditional stuffed tigelle sandwiches and lambrusco, the sparkling red wine this region is known for. I’d never had lambrusco before, but it was love at first sip. This is a very easy drinking wine: fruit forward, slightly tanic, and just enough bubbles to tickle your nose. We ordered a huge assortment of stuffed tigelle, mixing different meats with vegetables and cheeses. The bread was just made and still warm, and had the perfect amount of filling inside. We sat outside and took in the views of the bustling ancient market, and planned out where we would eat dinner. Because, you know, that’s what you do when you’re in Italy. 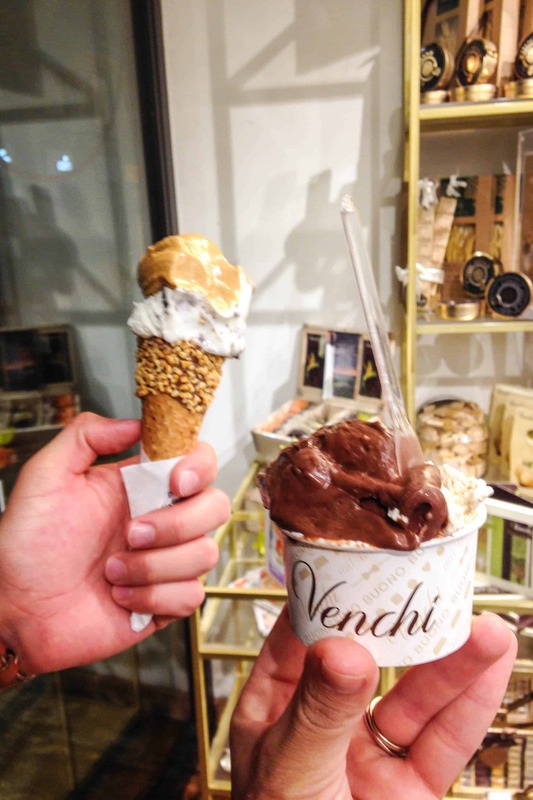 We spent the afternoon exploring the stunning Basilica of San Petronio, browsing through shops and discovering the most incredible gelato at Venchi, a chocolate shop. My instincts told me to order chocolate, but I couldn’t pass up my favorite combination of pistachio and ricotta with figs. It was totally dreamy, and I knew we’d be back again for more. That night we were lucky enough to snag a table at the very busy Trattoria da Gianni, a recommendation from my new friend Vicki. 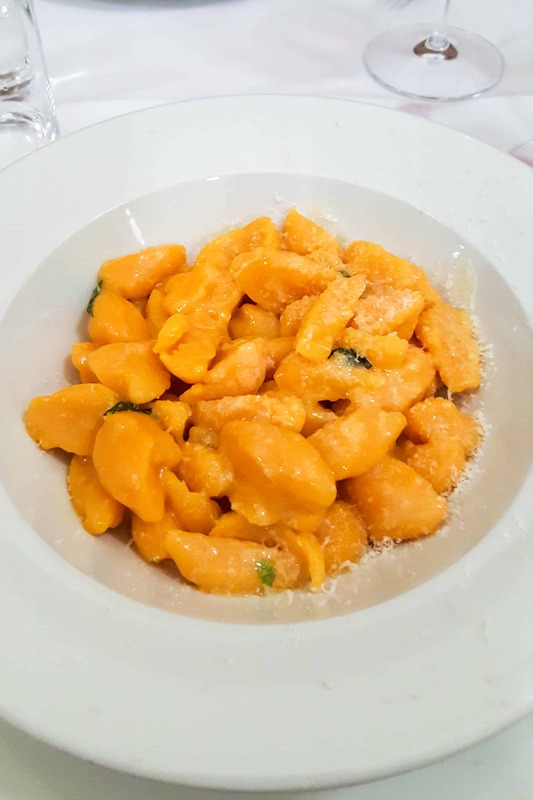 We ordered two pasta dishes to start: Pumpkin gnocchi in a simple butter sauce that had the slightest flavor of caraway, though I don’t believe there was any actually used. It was rustic and homey and satisfying. The other was a traditional tagliatelle al ragu, or pasta with Bolognese sauce. After all, they don’t call it Bolognese when you’re in Bologna. It’s just ragu, or sauce. 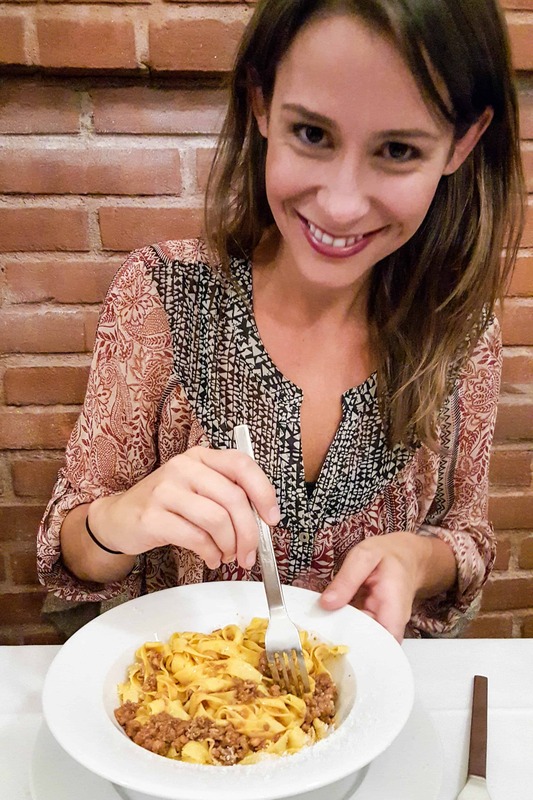 It was good – the fresh pasta was especially well made – but nothing to write home about. The wine on the other hand, a super Tuscan, was fantastic. For our entree, we opted to share the special, a seared duck breast. The waitress piqued our interest when she described it as being served with a grapefruit sauce and pine nuts. Yum! Only when it came out, we were confused to find it had something more akin to marsala sauce or gravy. We dug in anyway, and it was tasty! Just not exactly what we were expecting. Then we realized there were raisins floating in the sauce and a lightbulb went off in my head. She didn’t mean grapefruit. She meant raisins! Which made us laugh, because grapefruit is such a weird name for a fruit that isn’t even remotely close to a grape. Poor girl. The English language can be so goofy. For dessert, we ordered creme brûlée. I was hesitant, considering this a classic French, not Italian, dessert. But knowing how great the dairy is in this region, I could’t resist. And I’m glad I couldn’t, because this creme brûlée was the best I’ve ever had. I’m talking absolutely bonkers ridiculously good. The color was almost neon from the farm fresh egg yolks, and it had an intensely creamy mouth feel. Not too sweet, kissed with vanilla and had a nice thick layer of beautifully burnt sugar on top. It was ethereal. 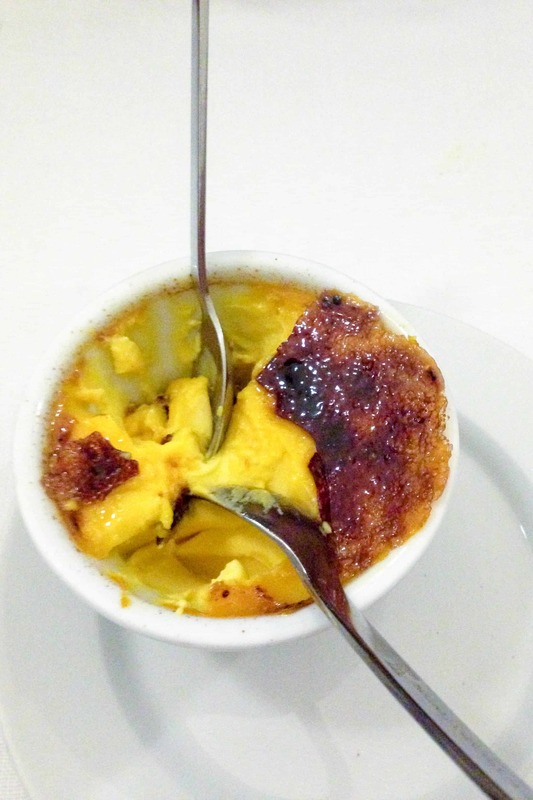 We were practically licking the ramekin once it was gone. The next morning was rainy, so we slept in and had a lazy morning sipping cappuccinos in our room as we watched strange (but awesome) Italian music videos on TV. 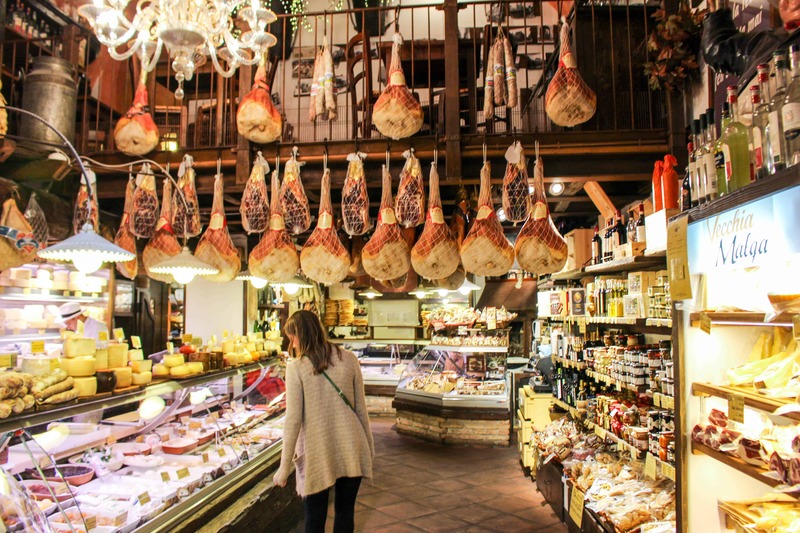 For lunch, we sat down at the iconic La Baita Formaggi, Bologna’s most celebrated cheese shop. 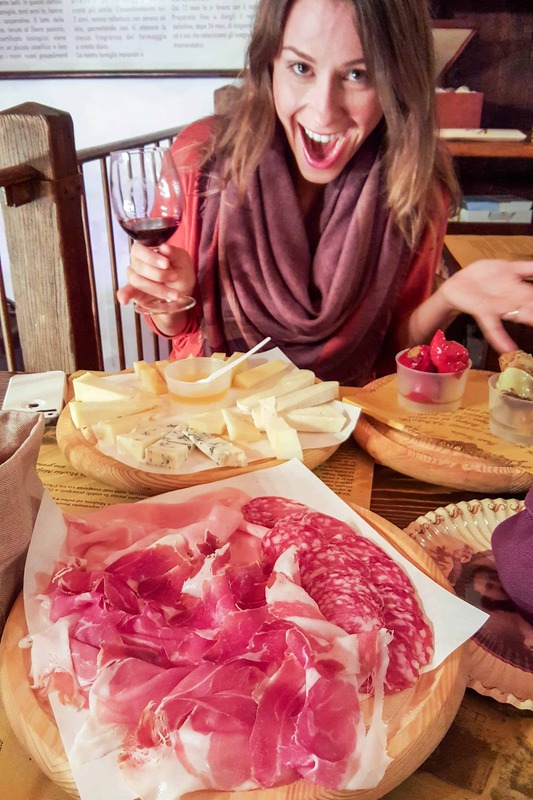 We ordered more lambrusco (because I’m officially obsessed), and two glorious meat and cheese platters. The meat platter had a sampling of salami, coppa, prosciutto di Parma and mortadella. The cheese platter had the perfect mix of hard and soft cheeses from the Piedmont region, including some of my favorites like Taleggio, Robiola and Gorgonzola Dolce, all served with local honey and bread. We also ordered a few marinated artichokes and little cherry peppers stuffed with tuna, because you know, vegetables. Do I even need to say how much I enjoyed this? Fuggedaboudit! 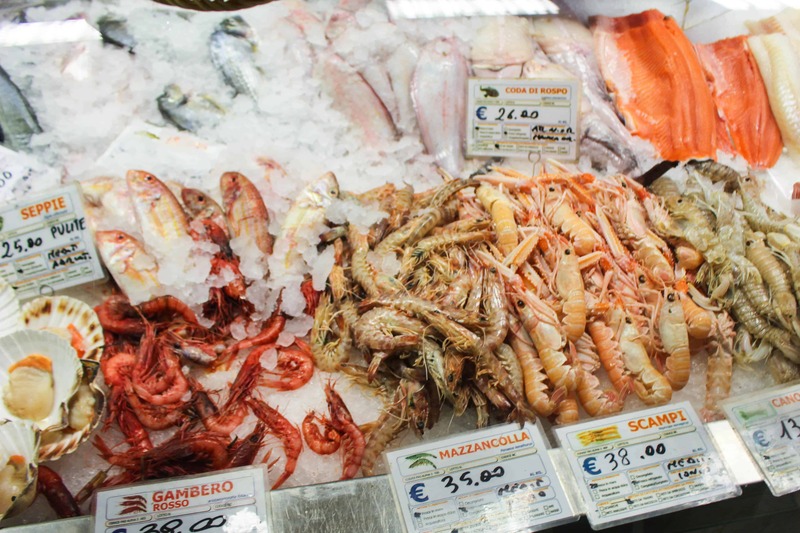 We had to walk this one off, so we strolled down Via Pescherie Vecchie and gawked at all the delectable treats surrounding us, ranging from vibrant fruit and vegetable stands to bustling fish mongers and butchers. It was exhilarating and inspiring for a food lover like me; I just loved being in the center of it all. As luck would have it, our walk lead us right back to Venchi, so we ducked inside to cop some more of their deliciously creamy gelato. I can’t even tell you what flavors we ordered because I didn’t write them down and the names were all in Italian, but I can tell you that it involved caramel, crunchy things and lots and lots of chocolate. 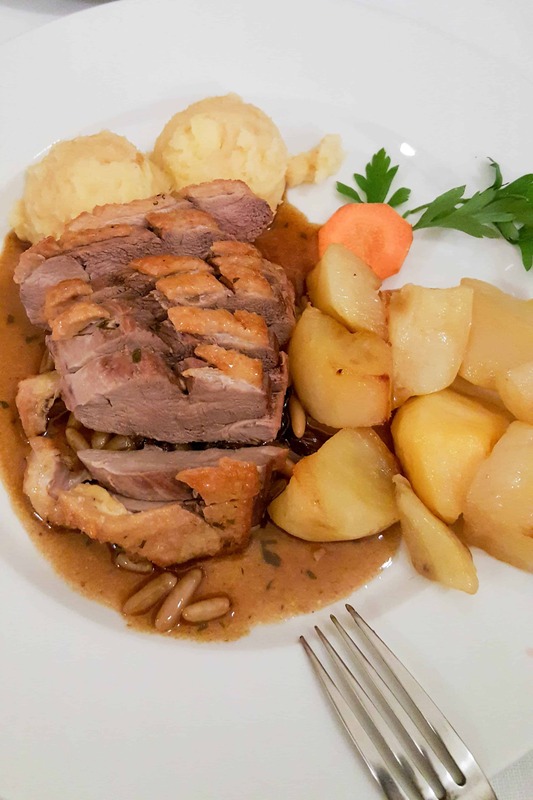 That night, we made reservations at Trattoria Oberdan da Mario, as per recommendations on Trip Advisor, and it did not disappoint. We ordered bottle of lambrusco, because “when in Rome Bologna,” you drink lambrusco. For a starter, we chose this potato and truffle gratin type thing (I believe they called it a flan on the menu?) because the reviews all said it was good, and also because… did you read that description? Of course we were ordering it. It was rich and eggy, truffely and delicious. 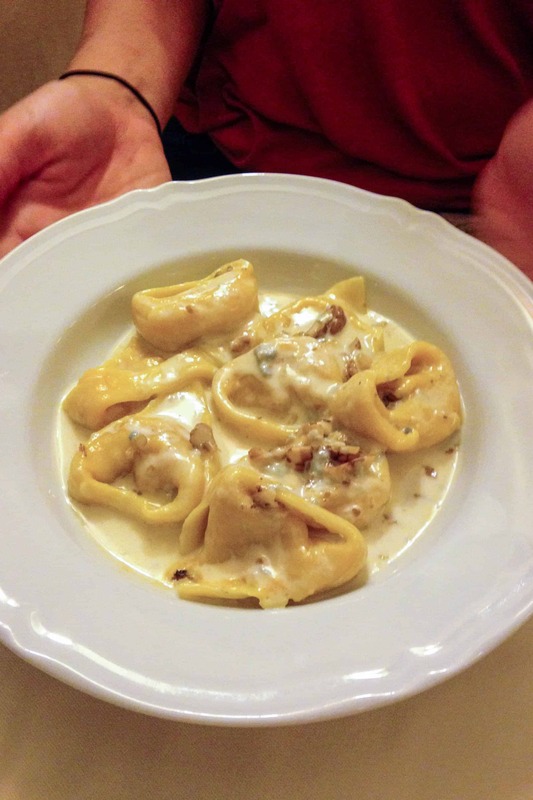 Next up, we ordered more pasta: tortelloni in a gorgonzola cream sauce with walnuts (amazing, nuff said) and lasagne al ragu. This lasagna nearly brought me to tears, it was. so. GOOD. This was nothing like the lasagna I grew up eating: a layered casserole of pasta, marinara sauce, ricotta and mozzarella, occasionally with some ground beef mixed in – you know the one. No. This lasagna was made with tender sheets of fresh green spinach pasta, an earthy bolognese sauce that had just a touch of tomato, rich, thick beschamel, lots of parmagianno and so much love you could taste it. I felt like Garfield, just shoveling it into my mouth with reckless abandon. It was gooey and melty and not one flavor overpowered another. Just typing this has my mouth watering and my heart racing. God, it was good. 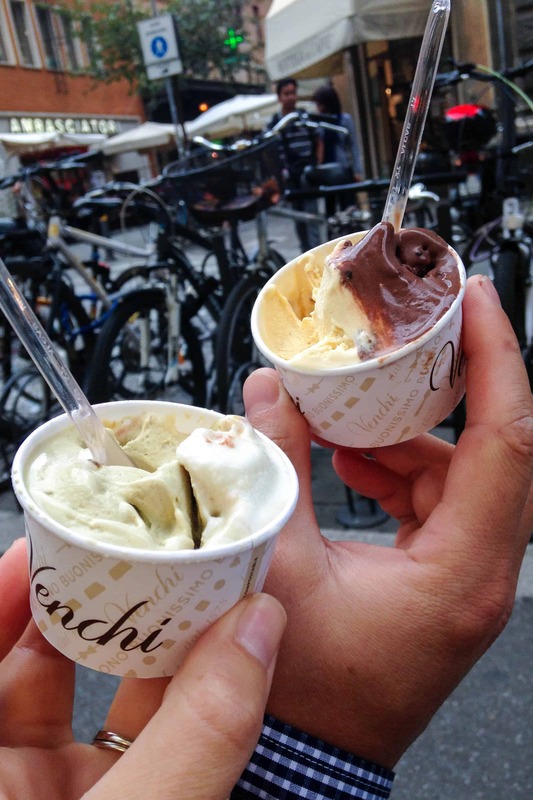 We skipped dessert and opted to walk back to our gelato spot and have one last taste of our favorite flavors: Ricotta with figs and pistachio. Perfect. 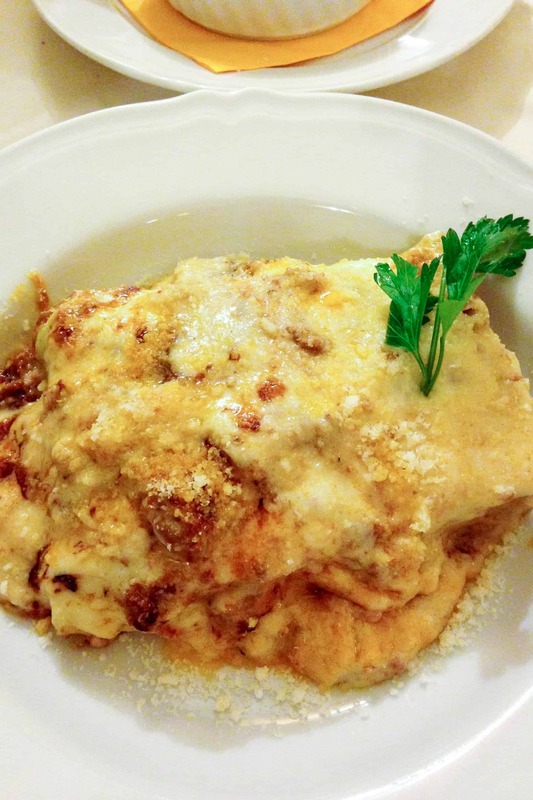 The next morning we found ourselves back at La Baita Formaggi for a quick lunch of thinly sliced roast beef with arugula salad and, (duh) more lasagna. It was very good, though not quite as mind-blowing as the one we had the night before. Then we packed our bags and boarded the train to Venice. This would sadly be our last leg of the trip, and I would find myself falling madly in love with a little thing called cicchetti. You had such an awesome vacation! I would be lying if I said I wasn’t jealous. Thanks for sharing your pictures and experiences with us. The pistachio and ricotta with figs gelato is killing me. Every leg of this trip has been so dreamy to read about. I don’t want it to end! One day I’m hoping to follow your footsteps, and how handy to have these posts to refer back to. Thank you so much for sharing your trip! Love it! Enjoy you take on the whole experience. You really get it! I’m so glad you’ve been enjoying it. One last post to go: Venice! Coming soon.